As I was loading the bike up on to the roof rack, two gentlemen came out of the hotel entrance engaged in a light hearted conversation. I could not believe my eyes as it suddenly dawned on me that those two gentlemen were none other than Jacques Anquetil and Raymond Poulidor. There was absolutely no one else around. At the time I was on my way to Brittany with a racing friend to get in some early season training and racing. We had stopped over for the night at this typical French Chateau style hotel that at one time was obviously the seat of some French aristocrat. Only two cars were parked in the elegant walled courtyard. My friend was still up in our room packing and there I was alone, and face to face, with two of the greatest legends of our sport. Panic set in, digital cameras and cell phones cameras had not yet been invented in 1971. In those years I rarely travelled with a camera. I have never bothered to collect autographs but this was different. In haste I grabbed the only piece of paper that I could see. This encounter demanded evidence! Anquetil and Poulidor had stopped, engrossed in their conversation half way to their car, as calmly as possible I set out in their direction. “Bonjour Messieurs”, I said. Both men nodded and then Poulidor quickly made off to their car. Anquetil, as elegant as always, courteously acknowledged my greeting and flashed his unmistakable smile. In my awful schoolboy French I struggled to engage Anquetil in a conversation. We spoke briefly as I lamely congratulated him on his unbelievable career. Patiently he nodded, thanked me and then pointed to the magazine that I was carrying (I had forgotten all about it). He pulled out his pen and dutifully autographed the cover for me. He was a consummate professional. To this day that encounter has given me a very different opinion on the generally accepted model of the Anquetil/Poulidor rivalry. Encapsulating the legend are the very famous pictures of the two men in a ‘death struggle’ on the Puy de Dome climb in the 1964 Tour de France. It was the 20th Stage and Anquetil held a 56 second lead over Poulidor. On the climb Spanish climbers Federico Bahamontes and Julio Jiminez pulled away from Anquetil and Poulidor. Few people remember that Jiminez won that day as the powerful struggle behind them had developed into epic proportions. Poulidor was known to be a better climber than Anquetil, but when pitted directly against his great rival, Anquetil would never concede an inch. Bumping elbows, the two men ground their way up the climb with Anquetil looking more ragged by the minute. With the finish line in sight, Poulidor jumped away and Anquetil almost stopped. At the line Poulidor had closed to within 14 seconds on Anquetil’s Yellow Jersey. That time gap was the closest “PouPou” ever got to beating Anquetil in a stage race or even winning the Tour. As famous as that incident is, the history of this rivalry included many tremendous duels. One of the most astonishing came at the 1966 Paris-Nice. A 33.5km individual time trial stage on the island of Corsica witnessed one of the greatest ever shocks in the history of cycle racing. Poulidor beat Anquetil at his own speciality by 36 seconds and assumed race leadership with the victory. All of France was in ecstasy. The very popular “PouPou” was finally going to beat Anquetil. Two days later, back on the mainland, Poulidor had to “simply” survive the final stage which traced the hilly terrain behind Nice in order to claim the overall Paris-Nice GC crown. Almost immediately Anquetil’s Ford-France team set about attacking Poulidor’s Mercier team. It is said that Poulidor and his team answered 38 separate attacks. The 39th attack came on a modest climb and it was Anquetil himself who attacked. Poulidor managed to capture Anquetil’s back wheel briefly before cracking under the intensity of the pace. At the top Anquetil faced 21 miles of mostly downhill and flat roads to the finish. Those who witnessed the ride say that it was the fastest 21 miles ever ridden on a bike. Anquetil finished soaked in sweat 1 minute 24 seconds ahead of the bunch containing a totally disillusioned Poulidor. Anquetil had won the Paris-Nice by 48 seconds and once more denied Poulidor of a race victory. A little over a decade before my chance meeting with Anquetil and Poulidor I had watched Fausto Coppi race. At the time I was a young schoolboy and our family lived very close to the legendary Herne Hill cycle track in London. Coppi (known as ‘il Campionissimo”, the champion of champions) was an international sports celebrity somewhat like Tiger Woods and Lance Armstrong today. My father was never a cyclist or cycling fan, but when he read of Coppi’s visit he decide that the event would make a great day out for the family. On that day in 1958, Herne Hill was packed to capacity with about 12,000 fans. I remember little of the racing but I do remember watching the gangly Coppi as he slowly circled the track for many laps to the deafening roar of the London crowd as they honored the great man. 1. His race exploits are truly the stuff of legend. 2. His private life, and in particular his affair with the “White Lady”, fed the gossip columns for many years. 3. And his rivalry with Gino Bartali polarised the entire nation of Italy. At that time you were either a Coppi-ista or a Bartali-ista. There are many stories that the divide often tested family relationships to breaking point. Coppi first appeared at the top of the sport when he won the 1940 Giro d’Italia during his first year as a professional. At the beginning of that year Coppi had been signed on by the Legano team to support Italy’s great champion Gino Bartali. As a domestique Coppi was supposed to be helping Bartali win the Giro. Instead, Coppi rode himself into the lead. Bartali was so incensed that he ordered his team to chase down their own team mate. From that time on their rivalry grew to mercurial proportions. Being by far the best riders in Italy, their national federation tried several times to get them to put aside their rivalry to race in favor of their nation. At the 1949 World Championships one of them should have won but neither could stomach seeing the other man win. They both stepped off their bikes rather than help the other. Italy was not amused and it brought down the wrath of their federation who suspended both men for three months. While this incident put both men out of action for a short time it stoked a huge pile of coals into the ‘rivalry furnace’. The media profited from huge magazine and newspaper sales as they churned out endless articles that increasingly magnified the rivalry. In parallel, all of Italy joined in the passionate debate as the populace became divided between the Coppi and Bartali camps. Prior to Greg LeMond introducing the concept of multi-million dollar contracts into the cycling world, professional cyclists made most of their money from race winnings and ‘appearance money’. After major races most riders embarked on a crazy criss-cross journey around Europe to appear at local criteriums and track races. I firmly believe that a rider like Anquetil, who openly stated that he only raced for money, was very astute in finding ways to enhance his fees. His rivalry with Raymond Poulidor kept both riders almost permanently in the headlines. Having seen both men alone and acting as any really good friends do, it is not hard to believe that during their racing careers, and behind closed doors, they plotted their rivalry in order to greatly enhance their earning power. This is not to say that out on the open road that their battles were not real. Anquetil would do anything to prevent Poulidor from beating him and for his part Poulidor (and most of France) wanted to dethrone Anquetil. Epic rides such as that day on the Puy de Dome or the final stage of the 1966 Paris-Nice eventually created many lucrative pay days for the two men due to their enormous crowd pulling power. From the 1940 Giro d’Italia until Bartali retired in 1953, the rivalry between Bartali and Coppi electrified many races and wherever they went hordes of hysterical fans would line the race courses. Capitalist tendencies were less obvious during that period, surviving the ravages of war was at the top of most people’s mind. However in our adulation of such legends we often forget that these riders were ‘professionals’. Being at the top of their profession Bartali and Coppi understood how to maximise their value. One of the few occasions that allowed a public glimpse of the true Coppi/Bartali relationship was during the 1952 Tour de France. 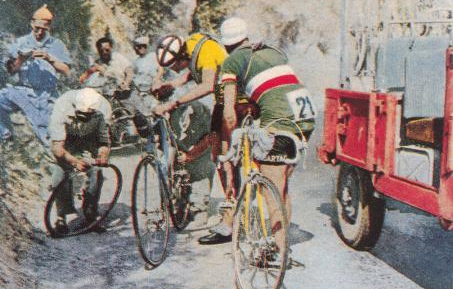 Coppi punctured on the Col d’Izoard and Bartali who was near to him stopped and gave Coppi his wheel. Sadly, both Coppi and Anquetil met premature deaths. Coppi contracted malaria while on a hunting trip in Africa and died in January 1960. He was just 40 years old. His funeral created a national outpouring of grief. Leading the mourners at the graveside was none other than his long time rival and, many believe, his best friend, Gino Bartali. Cancer took Anquetil from us in 1987. He was just 53 years old. Like Bartali before him, Raymond Poulidor led the mourners at the graveside of his great rival and best friend. We may never see ‘partnerships’ of the Coppi/Bartali or Anquetil/Poulidor type again. The sport is all the poorer for that. There were two chances during Armstrong’s seven year Tour reign for great rivalry’s to blossom and feed the popular imagination. The press loved to focus on the Lance Armstrong/Jan Ullrich rivalry but it never reached the emotional intensity that accompanied their forebear’s relationships. Likewise the battle between Marco Pantani and Armstrong never matured. I happened to be near the summit of Mont Ventoux at the 2000 Tour de France when those two charismatic riders appeared side-by-side. Pantani won the day and Armstrong claimed that he ‘gifted’ the win to Pantani in recognition of his great battles throughout that Tour. Later at the post-race press conference Pantani exploded with indignation stating that a great champion like he needs no gifts. Earlier generations of great champions would have seized on such incidents to fuel their earning power. It is unfortunate that neither Pantani nor Armstrong took the lead in nurturing a ‘lucrative rivalry’. Had that been the case it is quite possible that Pantani would not have met his tragic demise. In our modern world great champions negotiate lucrative contracts and even more lucrative endorsements to feed their bank accounts. Yes, there are rivalry’s on the road, and off the bike many of today’s champions are very good friends. To the detriment of the sport, the showmanship that enthralled the fans of yesterday is gone. Modern technology and ice cold corporate style race planning and execution has sterilised the incubator that created larger than life heroes engaged in brutal rivalries and mostly hidden friendships.